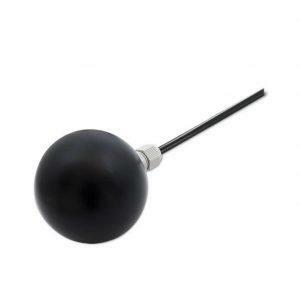 Radiation Sensor ANDSTF passive sensor for indoor temperature measuring applications. The sensor is suspended from above, making it especially suitable for temperature measurements in large rooms and halls with a high ceiling. The Radiation sensor is used to record an accurate measurement of the perceived temperature. With the help of the respective sensors (see table), the device can be connected to all conventional control and display systems. Further cable Types and lengths (including multiple wire connections and combination sensors) available on demand.